“Keeping Up With Johnsons” is a very good episode of Black-ish. In fact, it may actually be the most fully-fleshed and realized episode of the season, as well as one that completely runs the spectrum of both black struggles and simply life struggles. You see, it addresses something that has become a major point of conversation about Black-ish and the Johnson family, which is the fact that they’re a very affluent family, and as a result, they are also a very materialist one. It’s a criticism that has been made a lot about the characters (especially Dre) recently, and it’s something that the show could easily ignore and just consider a part of the world and its characters. But Black-ish isn’t a lazy show, which is the show’s blessing that has led to the curse of certain episodes feeling like they’re coming up short. “Keeping Up With The Johnsons” is Black-ish at the top of its game, and that’s far from lazy. Obviously, the key to any good episode of Black-ish is a proper balance of both Dre and Bow, and “Keeping Up With The Johnsons” has that in spades. I’ve pointed out before that the show could stand to go with a little bit more of Bow’s side of things, both despite and because of how good she (and Tracee Ellis Ross) simply is on her own without the support. We see Dre’s work-life all the time, and it’s always a highlight. We have Dre’s parents around all the time, and that’s also a delight. But it’s a rarity for Bow, despite the moments when we see Bow’s life outside of Dre feeling like the show really striving to reach its full potential. Because of this, the return of Bow’s mom (Anna Deavere Smith), even in just the virtual world, is a little touch that goes a long way in this episode. It’s unexpected and it’s almost unnecessary earlier in the episode, but it’s so good. As for the episode plot itself, unless it’s part of the premise (The Beverly Hillbillies, Arrested Development, The Hughleys, Schitt’s Creek), sitcoms like to pretend that characters within a certain socioeconomic class, good or bad, aren’t able to fluctuate in and out of said class. Roseanne is one hell of an exception. But Black-ish has made it clear that Dre’s “started from the bottom” sensibilities have turned him into the splurger that he is today, and it’s the reason why he spoils his family. But there’s expectedly never been any suggestion that such a lifestyle could become a problem, despite how unrealistic that is. At least, not until now. And it makes sense, as it had to happen eventually to not make Black-ish take place in a fantasy world. Yes, Junior has a Terminator-esque scanning moment with Zoey in this episode, but it is not a fantasy world. As great of a sitcom married couple as Dre and Bow are (arguably the best since Happy Endings’ Brad and Jane), they’re not perfect, and there’s also no chance that the way they over-indulge their children can be perfect either. 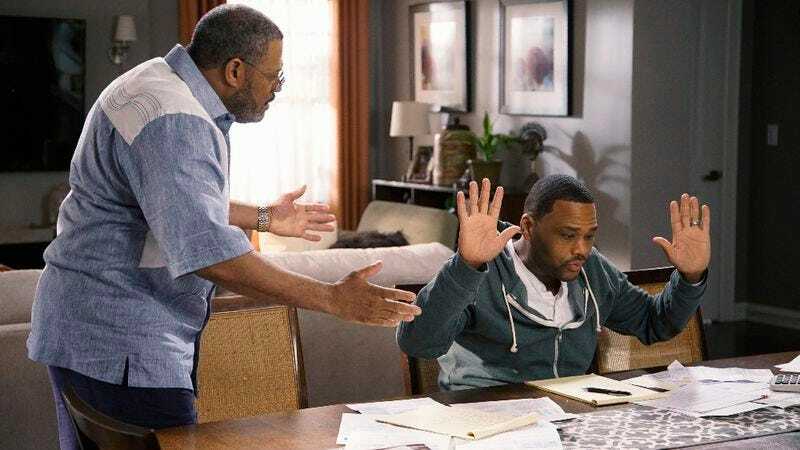 They’re not in squalor, but the idea that the Johnsons finally have to think about their monetary decisions—even if it’s just for this episode—is a way for the show to address the one thing that really makes Black-ish feel almost too unreal at times. Personally, I’m not wealthy by any means, nor did a grow up that way, but I can say I especially feel for Bow in this episode when it comes to cutting back. Dollar store hair products might as well be placebos for hair! On the other hand, I can’t say I feel the same about Dre’s entire shoe and clothing situation, but at the same time, the idea of black male culture and shoes and clothing is more something I’m aware of—like the idea of barber shop culture—than I’m actually involved with, and as shallow as it appears, it tracks here too. As does the conference room scene in this episode, which really shows the disparity between Dre and his white co-workers a lot more than usual, as they can’t begin to fathom the heavy amount of cash he carries or his perspective on style. We see these characters “help,” him so often, but it’s easy to forget that they really don’t know him or his life at all. Plus, Dre is a character who is so driven by his want to both get away from his past and take pride in it, which is something that’s lost a lot when discussing the character. Dre blaming Pops near the end of the episode for the fact that he never taught him about money strikes a chord, because the show doesn’t need to try to be making you cry to bring out a real Dre/Pops scene. It’s honestly almost surreal to see this all unfold on this episode of Black-ish (and at this point, Black-ish in general), but it’s just so right. Everything work even extends to another very good kids’ plot where Junior/Marcus Scribner really gets to shine—even before he and Jack go full Wolf Of Wall Street. It’s actually pretty interesting that Diane has very little to do in this plot where Junior and Jack are the “brains” of the operation, but given the way that the plot ends, it all makes a world of sense. Lately, Black-ish has found a way to stretch its A-plots by simply making the episode B-plots group children plots (instead of allowing them to have their own separate plot), without having the characters losing their individuality, which is key. Also key? Jack’s little suit and Junior’s attempt to find an insider trader in Apple. I really want to talk forever about this episode—since I haven’t even hit the entire concept of Dre being able to provide for his family—but at the same time, it’s an episode that very much speaks for itself both through its humor (it’s very funny) and through its message. The one thing I can really see people taking issue with here is the idea that both Bow and her mother don’t understand money, but as the episode makes clear, Bow’s hang-ups are the result of her mother; and as for Bow’s mother, it’s not as though Bow’s father understands (or understood) money either. As for the rest of the episode, it’s still amazing to think about how both funny and poignant it actually is. Then again, that’s how Black-ish should always be. Let’s be honest: The episode won the moment it opened with “All Falls Down,” despite then being a reminder of present day Stacey Dash. As soon as it turned out that John Witherspoon was James Brown the accountant, both my brother and I reacted with our own versions of “oh, that makes sense.” Hopefully they find a way to bring him back. Please, Black Jesus. Mr. Stevens (re: paper money): “This is made from the exact same material as a cocaine straw!” I definitely had to pause for quite a bit after this moment. So. Much. Sweating. They really made it the most unpleasant thing in the world to see in the first instance. This is an episode that might ping the senses of those who aren’t the biggest Anthony Anderson fans, but his over-the-top behavior, sweat and all, really make sense here.